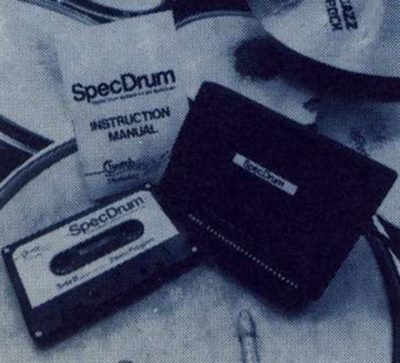 SpecDrum is a bolt-on package that gives you a kit of drums. Not your usual naff drum noises, but real drums sampled onto a chip. Very briefly this means that the sound made by each drum is stored digitally. When the unit is fired up it makes sounds which are just like the real thing — well, nearly. More to the point, most records use some form of digital drum nowadays, and so the sounds produced with SpecDrum are familiar and really great to work with. On a technical note it can record any sort of time signature and beat known to western civilization. The hardware is contained in the usual matt black box with a phono lead attached. The latter can be plugged into an audio amplifier, a mixer, a recorder or even a megawatt PA system depending on the proximity of your nearest and dearest. Within this box are the chips which produce the drum sounds. The accompanying program allows the Spectrum to fire the drums at your command and fashion the timing into any complex arrangement, depending only on your inventive ability. SpecDrum comes with a standard kit: Bass Drum, Snare Drum, Mid and Low TomToms, Cowbell, Hi Hat open and closed and Hand Claps, although there is no side or crash cymbal which is a little sad. The sound quality of all these is excellent; having used them on my own tapes which have been played to long-suffering colleagues, the verdict was pretty unanimous — for less than £30 it is an absolute giveaway, considering that a drum machine will set you back around £250 and is not half so friendly to use. What’s more you can load up different drum sounds, programmed on the other side of the cassette, and have a different kit, and new tapes are planned — a Latin kit is already available. The unit comes complete with a clear and comprehensive guide book. In outline what you do is write a drum pattern, let’s say of two bars length. You can either do this by tapping in each drum/key in turn to a fixed metronome beat (realtime) or by writing direct onto a graphic display (steptime). A little bit of forethought is needed here as you will need to decide how many drum strokes you need for each musical beat. (You can divide each beat into 32 strokes if you’re that barmy!). The program initially defaults to a fixed tempo, but this is easily altered either by numeric input or more simply by pressing L or ENTER while your pattern is playing back. Any change of tempo is noted and stored away. Regardless of how you have created the pattern, you can see it graphically. The edit option gives you complete control to add or take away whatever drumbeats you like, but if that is too difficult, go back to the realtime page and delete or add the drum you want as it plays. A really useful feature of the realtime writing option is that the micro compensates for your lack of accuracy, and shoves the tapped-in drumbeat to the nearest division of a beat. You can file your short drum pattern away. Songs rarely consist of the same drumbeat all the way through: the most bovine of skin-bashers likes a variation every now and again. Answer: create another pattern. And then another. When you have a compendium of short patterns duly filed and numbered it’s time to assemble them into a song format. The Song Edit page allows the patterns to be edited into a sequence, with individual patterns repeated and placed into whatever order you see fit. The whole format (now called a Song) is given a name and can be dumped onto cassette and recalled later. A song could consist of 255 entries, each one of which may be looped 255 times — enough for several hours of endless drumming. The program can store up to 16 songs at one go which is more than enough for the most ambitious rhythm merchant. Although it has eight drum sounds, SpecDrum can only cope with three channels, meaning that some drums cannot be produced simultaneously. But this limitation has been catered for, and presents no real problem. The update cassette has a chain editor on it. With this you can reverse the sound of any drum — Simon Goodwin has more information in this issue’s TECH TIPS. I would have liked to have seen a volume and accent option so that some beats could be sounded louder than others, but for the real whizz kids the units offers a syncro pulse input/output. If you’re recording onto a multi-track machine a sync pulse is put onto one track. You then record each drum on a separate track, using the recorded sync pulse as a master clock for the program. You are then free to alter the sound of each drum individually and boost or cut the volume at will. In operation I found the SpecDrum’s noise level quite acceptable. To sum up, this is a major achievement for a ridiculously low price. SpecDrum is very easy to use and the sounds are certainly good studio quality. Even if you can’t play drums but are keen to add a bit of solid beat to your musical instrument at home, then this is your wisest choice, and it would be a good idea to set up a number of patterns for quick use. If you have a relative with a keyboard that has one of those horrid drum boxes you could do a little cost sharing — Relative gets a far superior drum sound, you get the fun of programming them up and the use of the SpecDrum to help you become a megastar. If you do end up rich and famous, please remember where you first heard about it — all donations gratefully accepted and quickly spent.